A political scandal in Britain draws attention to labor exploitation that extends far beyond a single T-shirt. The scandalous headline splashed across the British tabloid page said it all: “This is what a CHUMP looks like: Miliband under fire for wearing £45 ‘feminist’ T-shirt that is made in a 62p-an-hour sweatshop.” The target of this Daily Mail exposé wasn’t the usual salacious celebrity scandal: it was a garment factory in the Indian Ocean island nation Mauritius, where reporters traced the origins of the now-infamous heather-gray shirts displaying the glib slogan: “This is what a feminist looks like.” It was part of a charity campaign to rebrand feminism as cool, fun, carefree and fashionable. And it can also be hypocritical, evidently. The Mail ran photos of Labour Party Leader Ed Miliband smugly posing in the shirt, alongside a portrayal of colorfully clad South Asian factory workers, apparently proudly displaying their handiwork—the same damning garment—in the grim Compagnie Mauricienne de Textile factory, full of women huddled over sewing machines. So that’s what a feminist looks like? The stunning juxtaposition in the tabloid spread, activists have pointed out, is actually quite an ordinary scene in the South Asian manufacturing hubs that feed the global fashion production chain, where women earn pennies an hour to produce clothes that sell for well over their weekly wages. Labor groups seized the opportunity to raise awareness about garment workers across Asia. The IndustriALL union coalition, which has also campaigned for the victims of Bangaldesh’s Rana Plaza factory disaster, points out that the factory workers were part of a larger labor system that fuels the fashion industry through mass exploitation. Workers face extremely harsh, hazardous labor conditions, while organized labor is often heavily suppressed. While the T-shirt slogan adds a tinge of irony, these factories, which had purportedly been vetted by the brands but were allowed to impose such conditions, are not the exception but the rule of global manufacturing. Since the Mail broke the T-shirt story, the campaign’s big-name sponsors, the fashion retailer Whistles and the charity Fawcett Society, have dodged media inquiries. But the labor activists who work with Mauritius garment workers have stepped up to champion their own brand of feminism. Local labor organizers have demanded higher base wages and revision of an outdated old payscale under a three-decade-old remuneration order. 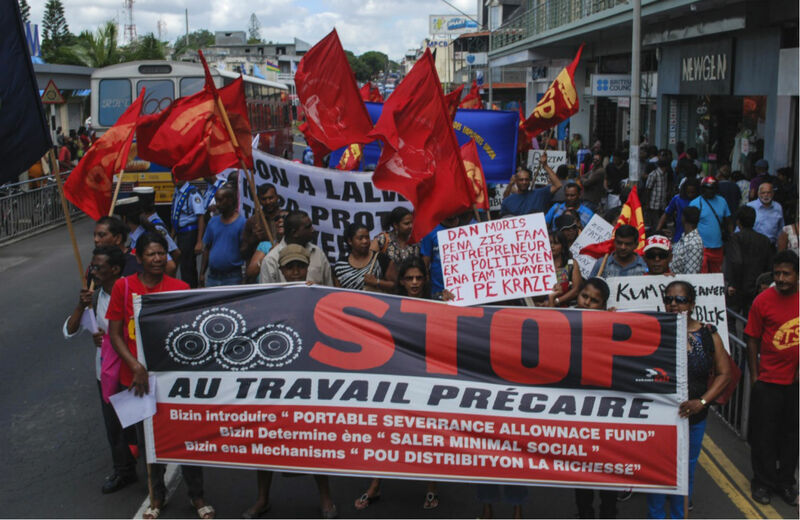 Jane Ragoo, general secretary, and Reeaz Chuttoo, president of the Confederation of Private Sector Workers (CPST) tell The Nation via e-mail, “It has the worst condition of work, i.e. 45 hours of normal work and 10 hours of compulsory overtime. The basic wage is even below poverty line.” (The estimated poverty line in 2012 was Rs6200 per month—about US$200—which is already just a fraction of what’s needed to support a family). According to media reports, the workers at the scandalous T-shirt factory earned about Rs6000 per month, including compensation in the form of food and housing (sleeping sixteen workers to a room in “prison”-like facilities). That’s about $190 per month—still less than half of the living-wage benchmark of US$458. The government estimates the income level needed to cover basic needs for a family of four is nearly quadruple that wage. Still, one thing that both working women in Mauritius and their Western counterparts have in common is that they believe work can be, despite the hardships, a pathway to economic advancement, enabling women to achieve some economic independence and to support their children’s education. It is an undeniable fact that every woman is a working woman. As a housewife, she is compelled to cook food, wash clothes and uniforms, caring for children and the elderly to enable their husband, father or son to perform their duty in their respective branch. As such all women are directly contributing in the growth of our country and they deserve to be covered under the social safety act. That may be the key takeaway from the High Street feminist fashion scandal: “Every woman is a working woman.” Maybe someone should put it on a T-shirt.